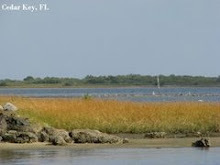 "Come back in the morning when the tide is low-- just about daybreak( 7:00 a.m.) and you will get to see a great number of birds feeding in and around the estuaries." 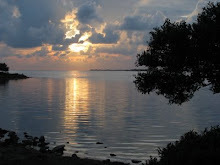 This from the friendly park volunteer to hubby and I as we pop in to the J. N. "Ding" Darling Refuge Visitor's Center on our way home from golf. We just wanted to pick up info even though our plan was to tour the 4 mile stretch of wilderness road the next day. Like good tourist on a quest for wildlife photo ops, we did exactly as instructed the next morning. Disappointment set in as we drove down the two-lane road out of our cottage bordered by beach residents on one side and the beach on the other. We knew the beach lay less than 100 yards away but we couldn't see it. It was extremely foggy and hazy that morning until about 10:00 when the sun shone through and burned off all the grey density. Of course we were quite finished gawking by then --not to mention the birds which were quite finished with their morning foraging. Talk about frustrating! I've never seen so many birds in the span of 1.5 hours and yet obtaining a clear photo was impossible. I took oodles of photos but all of them filmy (as above) or worse. On our first day on the islands -while at the conservation center purchasing plants from the native plant nursery- I kept hearing a Red-bellied woodpecker and this Pileated woodpecker just beyond borders of the nursery. Fortunately I had my camera around my neck so I excused myself from the fellow helping me and slipped away to snap a few shots of both. He kind of laughed and mentioned his fellow worker was kind of that way too when she heard birds so he understood. 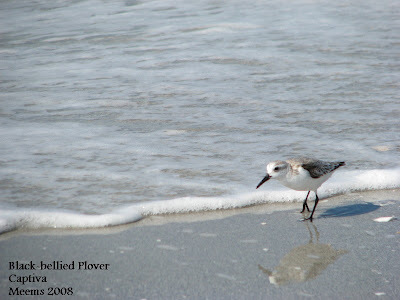 Back to the beach after the foggy morning when all was clear and bright there was no lack of shorebirds to snap. 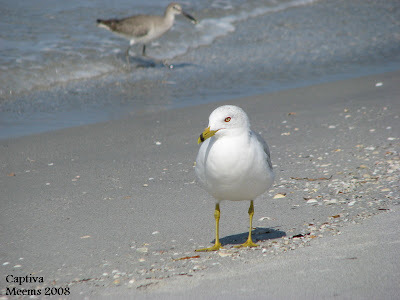 Here the Ring-billed Gull is looking for a hand-out so getting a close-up was not much of a challenge. Black-bellied Plovers fascinate me and though I'm new at this photography thing- I find myself very happy to capture as many photos of them as I can. Not sure about the ID on this one. My guess is a Ruddy Turnstone but I can't be certain. It has orange-ish legs. 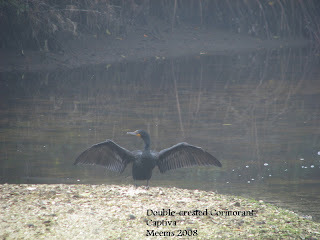 Any help from my birding friends is more than welcome. While lounging on the beach that afternoon thinking how blessed we were to have the beauty of the horizon and the shore lapping in the rythm that soothes my soul I noticed this GB Heron sauntering- and they do saunter right in front of me. I had also noticed a family doing some fishing just a little way away. Instantly I knew it was the fisherman the Heron had its eye on. Patience and time proved to be advantageous for this magnificent creature. 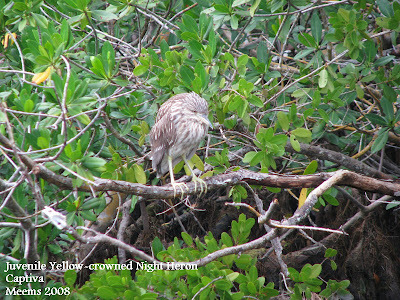 The fisherman tossed a fish in the shallow water and in the blink of an eye the Heron deftly harpooned it with its beak. Making certain he moved far enough away from the flock of nearby begging Gulls that they weren't going to have the chance to taste even one morsel. Then with the same skill he snagged the fish from the water he quickly flipped the fish upright turning it head first into its mouth. 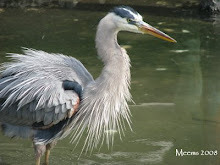 In about two gulps the fish was sliding into never never land as a partial meal for the Heron. The Heron did some preening and what seemed like a little satisfactory gloating and then returned to its position waiting for more. Hmmm... you'd think an entire fish would be plenty but they will continue this process. We had to go back. I couldn't stand it --having felt like the day before left me wanting. On our way out of town on Sunday hubby took me back through the Refuge only this time it was a little later in the morning. The tide was in and not much activity. Even though I've lived here all my life getting to observe these enormous White Pelicans is a treat. They migrate here for the winter. It was very cold (well for Florida it was cold) and quite blustery the morning we left for home. All the birds were puffed up trying to stay warm I suppose. 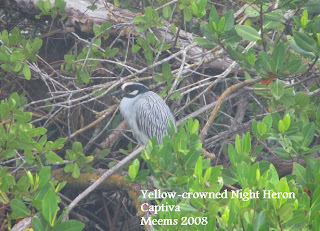 This was my first Tri-colored and my first Juvy Yellow-crowned. 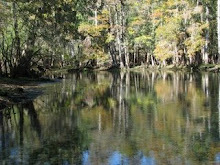 The "Ding" Darling Refuge is 6000 acres of natural beauty. 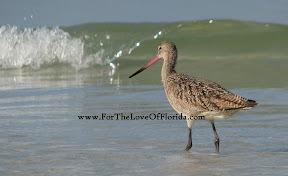 With so many wonderful birds left alone to nest, forage, and freely come and go. 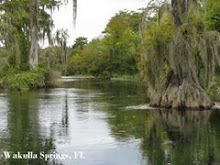 As a matter of fact the islands of Sanibel-Captiva are unique in that they have conserved a large amount of the islands to be forever kept natural. Amazing pictures of the great blue! It's been years since I've visited Ding Darling. Those foggy mornings can be so frustrating! I'm kinda partial to the black-bellies, as well. It won't be long till they look quite different in their breeding plumage. You did a great job capturing the hyper little turnstone. And was that a spoonbill in the white pelican shot? 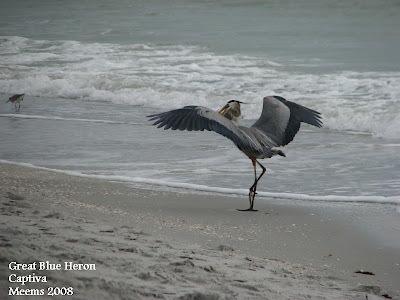 Sophie: That Heron performance was pretty amazing and so happy I was able to maneuver myself to capture it. 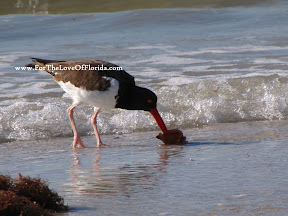 Hey- thanks for the help with the turnstone... funny how the description in my "Florida Birds" book mentioned their activity of turning their prey and I have a whole photo series of this one doing just that. YES -it is a spoonbill and as hard as I tried I couldn't get any closer to that one or the other 5 or 6 we had seen the day prior. I'll keep trying before I check that one off my "first time capture" list. Your photographs were outstanding - I loved the Great Blue Heron series. 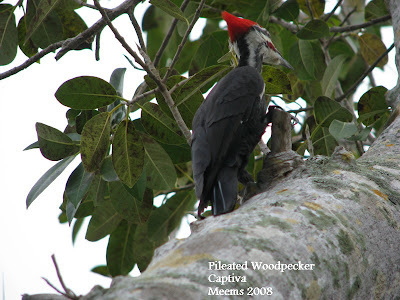 The Piliated Woodpecker picture is beautiful. so i'm thinking you need to go into business and start selling your amazing photography. can you come takes pics of my little one for her 3-year photo? kate: Thanks for looking through my photographs and for the kind comments. 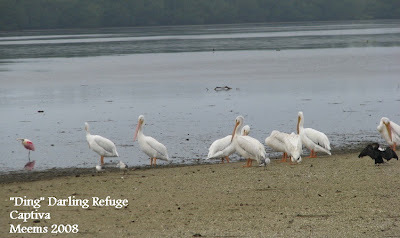 The refuge was a peaceful respite and so many species of migrating birds are happy there. lisa: You are too funny. In all the fun I'm having with learning to photograph landscaping and nature I really don't do such a great job with people. I keep practicing though- ask my family- I drive them crazy most of the time clicking away wherever we are. 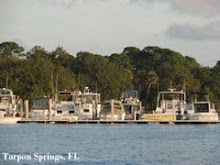 This place looks wonderful, both in your photos and on the website. 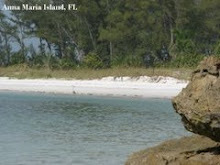 Some family members used to stay at Sanibel every year, but never mentioned the wildlife refuge. Their visits were always in summer when the kids were out of school but the website says January to March are the best birding times. You make Florida look very appealing! You were right. The photos of the Heron with the fish are awesome. Love the one with the whole bottom of the fish showing. 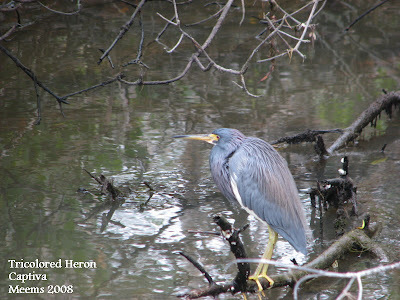 The fish appears to be too large for the Heron at that point. Great action shots.